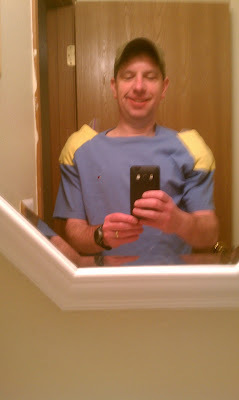 Here is my foray into the fashion design/physical therapy arena :-). As I mentioned in a previous post, I'm prone to swimmer's shoulder. In fact it sidelined me from doing an Olympic distance tri in my first season. Since then, I do the minimum amount of swimming possible to complete the swim portion of my triathlons with ease. I would love to swim more because I'm pretty slow, but when I swim more, my shoulders start to ache. Enter the swimmer's shoulder shirt. While sitting on the couch, not wanting to hold a bag of frozen corn on each shoulder, I came up with the idea to take an old t-shirt and sew pockets over the shoulder area to hold heat packs and bags of ice. The thought being then I can sit on the couch in the evening and have both hands free to catch up on blogs and twitter. So I grabbed a couple old t-shirts, put one on and held a ziplock bag on each shoulder and drew an outline of where I wanted the pockets. I should have measured because as you will see, the pockets aren't symmetrical :-). After my workout Tuesday night, I decided to try it out. I now present the swimmer shoulder shirt :-). The plan was to alternate between heat and cold, ending on cold. Crooked grin :-) Never noticed the paint on the door trim. The result? Partial success. I was indeed able to watch TV, blog, twitter, etc while my shoulders got some heating and cooling. The shirt was too loose so the heat wasn't as hot as it could have been. I had to press on the pockets to really get my shoulders to warm up. Same with the cooling. 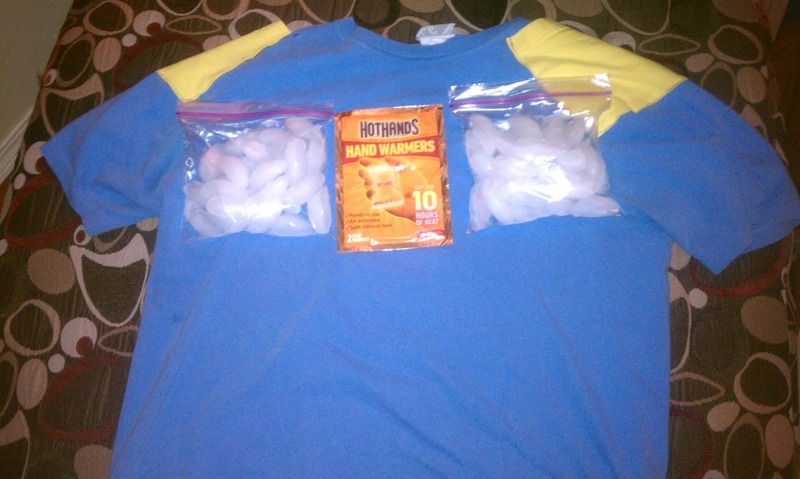 The shirt was kind of baggy so the weight of the ice makes the pockets drop forward. 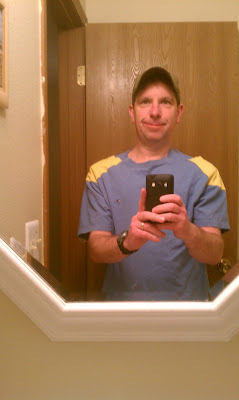 I need to find a tight fitting shirt and repeat, maybe an old compression top. So much for my debut. Hopefully you got a chuckle out of this if nothing else. Oh my goodness. I haven't "chuckled" this hard all week! NOT because of your shirt...that's just awesome! It's your pictures and comments under them. You made my day. Good idea on the shirt!!!!!! Maybe a slight fashion flop, but definitely chuckle worthy. Necessity is the mother of invention - corollary: trial and error is part of the game too. The crooked grin cracked me up, bc I was totally imagining you feeling both silly and proud of your ingenuity. :) Now you just need to buy a tight shirt and try again. That idea is killer. I think I said that before. I'm not sure you should have posted this on the blog world before you got a patent!! Absolutely ingenuous!! The fact that you can sew is going to have me in awe for a few days, well done sir!! haha! I was going to say the exact same thing as Jill - Put a Patent on that!!! Nice job. There's some kinks, but overall, a solid idea. I think you've got the right thought with using an old compression shirt. Yes, I agree with Jill! Get a patent and copyright your photos! Also - I agree the idea of a compression top will improve the design. That's a terrific invention. I need one. Style wise however, I think it lacks a little something. I had to laugh thinking it looked like 1980s shoulder pads. I think 110% Play Harder might sell something like this. I know they have pants with ice pockets anyway, but maybe not shirts.